If you're following along, I'm working in Counter_START.story. Now that our variable is created, the next step is to create a trigger that increases or decreases the variable's value. 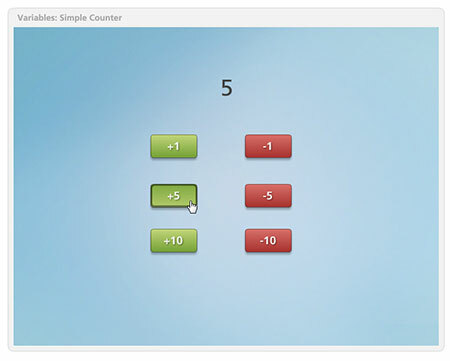 In this step, we'll set up a trigger to increase our variable by +1 each time the user clicks a button. We have our variable set up and a trigger that increases the value. But how do we know this is working? We can insert a reference to the variable on our slide that will dynamically update when we click the button. Go to Insert > Text > Text Box and click once on your slide to create an active text box. Preview your project and click the button. Each time you click, the variable reference updates by a value of 1. Want to see things go in the opposite direction? 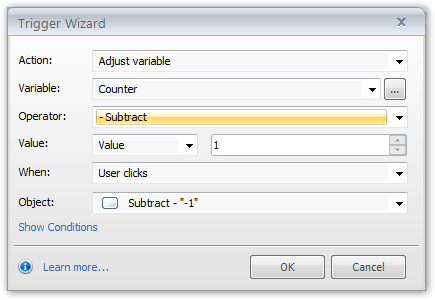 Add another trigger to subtract from the Counter variable. Since we already have the first button and trigger created, we can duplicate it and modify the trigger. You can add any value to increase, subtract, divide or multiply the values.